My secret blog this month was Mom’s Crazy Cooking – a blog filled with quick and easy recipes (as well as some fancier fare). I’m on an extremely limited diet right now, and I thought it would be impossible to find a recipe that I could both make and eat. (There’s always the kiddo to feed, of course.) But, I found one the fit the bill with only 1 tiny change – Green Beans with Pine Nuts. Okay, some might consider the fact that I can’t eat pine nuts a rather “major” change. But, when you’re used to modifying every recipe, swapping out a seed for a nut is really no big deal. Despite hating the process so much, it never occurred to me just not to do it. 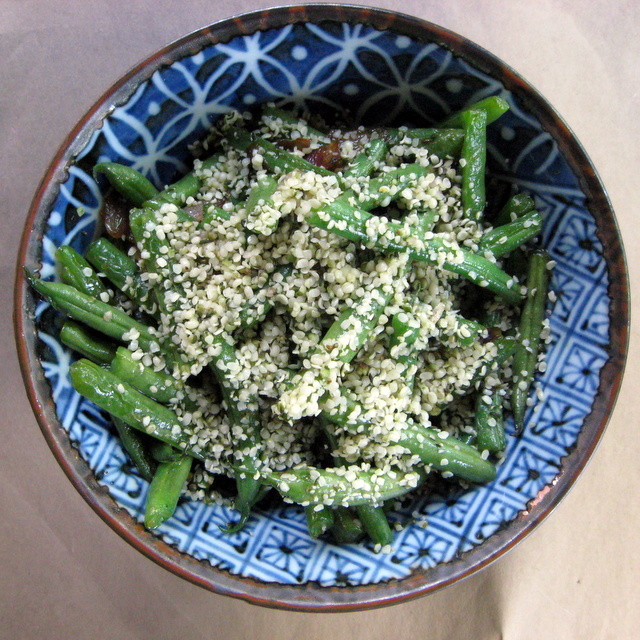 But, thanks to Tina, I now have a new favorite go-to way to cook green beans in the summer. I’m thinking next time I might use sesame oil and lots of ginger and maybe a bit of garlic, too. In a skillet, sauté the onions in the olive oil until soft. Add the green beans and cook for 5 minutes, stirring often. Add the water and salt and pepper. Cook until tender. Mine took about 4 minutes. Top with hemp seeds and serve. This entry was posted in beans, Blogger Community, grain-free, nightshade-free, side dish, vegan and tagged green beans, recipes, side dish, vegan. Bookmark the permalink. The texture on these after this (longer than normal for me) cooking time was almost creamy. Weird to describe a green bean that way, but that’s how it felt. I definitely liked it. But, stir-frying quickly will be my next experiment. Green beans and I go way back, always looking for new and exciting recipes this is a must try this week…looks fab! I’m not a blanching (or extra pot to clean) fan but, if I need to, I need to. I like the idea of blanching in the skillet 🙂 These look so good! This looks wonderful! I haven’t been a big green bean fan until recently. Now I can’t get enough of them. Great SRC pick! It is green bean season and I got a ton of them in our veggie box this week…love to try new recipes! Thanks for the great SRC selection. Okay funny thing is I have NO IDEA what blanching is???? HAHAHA, so I didn’t know I was doing them any different then anyone else! HAHA! Anyway, so glad you enjoyed my recipe. I love it too! Blanching is where you cook the beans in boiling water first. Then, when they’re just crisp-tender, you plunge them in ice water to stop the cooking. It’s actually great when you’re doing multiple courses, because you can have the beans par-cooked (blanched) and then just do a quick finish in a saute pan to reheat and add flavorings. that looks super yummy! love the hemp seeds on them! Thanks. The hemp seeds are really tasty. I’m learning to really appreciate them. Good source of protein, too. I agree–blanching is a pain! Perfect SRC pick. I’m in the never blanch category too. Your change to hemp seeds is very interesting, I’ve never tried them. Looks delicious though. These look really good and healthy! Green beans are one of my favorite summer vegetables and I’m always looking for recipes that are quick and easy…with lots of flavor too. Love this recipe choice. When beans are in season and so super fresh like right now, the kind of prep that leaves them with a little crunch is the best. I’ve never had hemp seeds but am really curious to check them out!